Mule deer hunts are for rifle hunters. Hunting is conducted on large private ranches in Montana where we can manage for quality trophy animals. The average deer killed on all properties is 5 years of age and on our best property we maintain a 170+ gross Boone & Crockett average. Hunter success has been at 95% for several years. Several 180 - 195 gross B&C and the occasional 200+ gross B&C mule deer bucks are killed annually. The Booth Ranch is our premier mule deer destination. The ranch contains 70,000 deeded acres in southeast Montana. The property lies in the Little Wolf Mountains near Colstrip, Montana. The terrain vareis from mountainous to broken foothill regions. Ponderosa Pine and native grassland make up the bulk of the vegatative community. A strong brush community in the draws and dry land alfalfa make for excellent mule deer forage and habitat. This is a very scenic ranch. 2017 was our 22nd annual Booth Ranch hunt that has produced some outstanding trophies. We are normally 100% success on large trophy mule deer. The trophy bucks will score between 160-185+ gross Boone and Crockett points. We have taken mule deer that score over 200. It's not uncommon to see 10-15 bucks per day. The Hamilton & Coffee Ranches is our other premier mule and whitetail hunting destination ranches. They adjoin each other and are located southeast of Miles City, Montana on the Tongue River. These two ranches contain 145,000 deeded acres. The terrain is classic mule deer country that is typified by rolling prairie, rough draws vegetated in grass and Ponderosa pine-covered hills. Large irrigated hayfields located on the properties often keep deer populations at high levels. We have hunted this property for many years and have been able to maintain a 5+ year old age on all animals harvested. These animals will score between 160 & 185 gross Boone & Crockett points. We have taken mule deer that score over 200. It's not uncommon to see 10-15 bucks per day. The ranch also has some excellent white-tailed deer. Trophy animals usually score 140-160 gross B&C points. Hunters can take one of either species. The properties are ideal habitat for antelope and several hundred make these ranches their home. Non-resident antelope license are by drawing only and are usually 10% success or less. 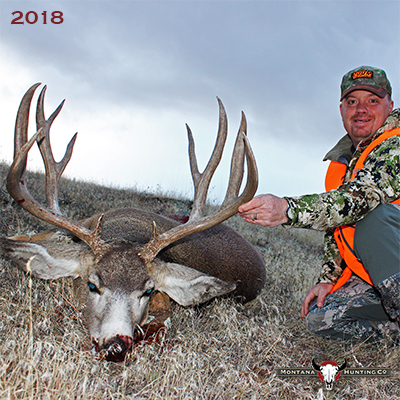 The first 2 mule deer hunts of the season coincide with the antelope season, and any successful antelope hunter is charged an additional $600 trophy fee. Antelope usually score 65-75 gross B&C points. This 40,000 acre ranch is located 35 miles north of Big Timber, Montana, at the east slope of the Crazy Mountains. The terrain is typified by a small creek that flows through the land for 12 miles, with large cottonwood trees and brush lined with small hay and grain fields. Off the bottoms, the land turns to heavy breaks and rolling plains. The creek bottoms are excellent habitat for white-tailed deer, and the rolling country is ideal for mule deer and antelope. The Glennie Ranch has very limited whitetail and mule deer hunting, with only 8 hunters a year. We expect hunters to kill white-tailed deer in the 130-160 class and mule deer in the 140-170 class. Hunters can harvest one antlered deer of either species. This ranch is located outside of Three Forks, Montana. The ranch is mildly arid with rolling to steep foothills that are sagebrush and juniper covered. Many acres of this property is dry land farmed, which creates wonderful deer habitat. The ranch also has over 20 miles of Missouri River frontage offering outstanding fishing. Trophy whitetail bucks will score between 125-170+ gross B&C points. Trophy mule deer bucks will score between140-160+. This ranch is also home to a small elk herd. The bull elk are hunted with a hard to draw permit. (Less than 1% draw for a non-resident) If you are fortunate enough to draw a special permit, you will have opportunities at outstanding elk. Lodging is included. TThis 35,000 acre ranch is located on both sides of the Jefferson River 30 minutes west of Bozeman, Montana. The terrain is typified by river bottoms with agriculture, cottonwoods and willows. The hills surrounding the ranch are arid with a juniper, sagebrush and grassland community of plants. Large mountain ranges are very close to this property making it very scenic. The river bottom is excellent habitat for white-tailed deer and the hill country is ideal for mule deer. The ranch has a small herd of good quality elk. Currently, we are offering hunters an opportunity to harvest them on a trophy fee basis. We expect hunters to kill white-tailed deer in the 120-160 class, and mule deer should be in the 140-170 class. Hunters in Montana can harvest on antlered deer of either species. The large agriculture component keeps deer of both species very visible.